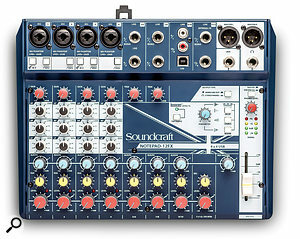 For instance, Soundcraft have incorporated a 24-bit two-in, two-out USB audio interface which can operate at either 44.1 or 48 kHz sample rates. This means that the Notepads could take on the role of an audio interface and monitor controller for a basic desktop studio setup, or be used to record live performances, with all the mixer channels, their effects and EQ printed to a stereo file in your DAW software — though it’s worth noting that the latter scenario requires you to remember to mute the mixer’s USB return from your DAW. Three models grace the latest Notepad series: the Notepad-5, the Notepad-8FX and the Notepad-12FX. The main difference between the two larger models is the channel count, though there are also some signal-flow variations and an extended USB implementation in the Notepad-12FX. The Notepad-5 (which, as the name implies, lacks the effects section of its larger siblings) and the Notepad-8FX include a two-input USB interface, while the Notepad-12FX offers four channels. Windows drivers are available to download from the Soundcraft web site, and you’ll also find any necessary firmware updates there too. 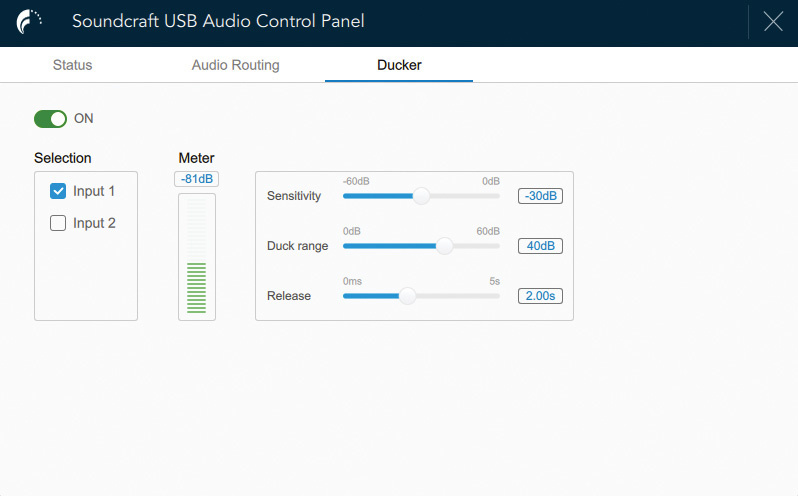 Mac users don’t require drivers for basic USB audio interfacing — it’s recognised automatically by the OS — but you’ll want to install the control panel software, which had just been made available for MacOS as I was completing this review. This software allows specific channel pairs to be selected as recording sources (this facility already existed in the Windows version). By default, a mix of all channels — including the return from the DAW — is sent to the USB recording feed, so this software is pretty much essential! We were sent the Notepad-8FX model for review and, as its name suggests, this has eight channels. These are arranged as: two mic/line inputs (1/2) presented on balanced combi XLR/jack sockets; two mono/stereo line channels (3/4 and 5/6), on dual quarter-inch jacks; and a further stereo channel (7/8) with a pair of RCA phono connectors. The last of these can also receive a signal from the USB return — the USB input is summed with anything that’s connected to the phono inputs. Using just the upper input jack of either stereo channel 3/4 or 5/6 switches that channel to mono operation. The master stereo output signal is delivered via impedance-balanced XLRs (which gives much the same benefit as full balancing but uses a simpler circuit) and there’s also an Aux out jack and a quarter-inch TRS headphones jack. This Phones output has a 150Ω impedance, so it will drive all but the lowest impedance headphones. As well as a compact footprint, the Notepad range has a fairly low profile, making them compact and portable.Structurally, the mixer is built within a robust, folded-steel shell, to which plastic end cheeks have been added to introduce an element of styling. All connections other than the PSU input are on the top panel. Speaking of the PSU, the mixer runs from an external power supply, a universal voltage, switch-mode type. This has a fixed cable at the low-voltage side that plugs into the back of the mixer, and a figure-of-eight hi-fi-style mains cable socket at the other end. (Personally, I prefer IEC connectors because they’re more commonly used in other equipment, which means I almost always have a couple of spares available in the event of failure!) Oddly, there’s no LED to tell you that the mixer is powered up unless the delay effect is selected, in which case the Tap Tempo LED flashes. 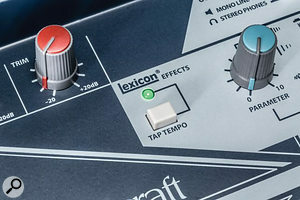 Effects legends Lexicon are owned by the same parent company as Soundcraft, which means you have access to some great onboard effects.The Notepad’s channel-strip layout follows the traditional analogue paradigm, though note that there’s just one aux send. This normally feeds the internal effects section, though it also feeds the aux send jack. In a departure from the norm, this accesses the signal pre-fader, so you can use the Aux out as a monitor mix. Channels one and two offer the most functionality. Channel one has an additional switch to change the line input (the jack socket in the centre of the combi connector), to a high-impedance instrument input. Both Channel one and two have switchable 100Hz low-cut filters, as well as full, always-on 48V phantom power for the XLR mic input. The continuous presence of 48V phantom power isn’t a problem for most mics (other than faulty or vintage ribbon types) or DI boxes, as long as they’re connected using a balanced cable. The mic amps claim high headroom, wide dynamic range and a good signal-to-noise ratio, with an EIN of -127dBu — which is pretty much what you’d expect from Soundcraft. The mic inputs produce a THD plus noise figure of better than 0.006 percent with a level setting of +10dBu, and in my experience with this desk I had no qualms at all concerning the sound quality. The specifications show the obligatory 20Hz to 20kHz frequency response, flat to within ±1.5dB. When pairs of channels are selected as USB sources the input channel signals are sent (post-gain-trim, pre-EQ and pre- the channel Level control) to their respective USB recording channel, while the two USB return channels are, as I mentioned earlier, summed with the RCA input signal in channels 7/8. This allows the main channel level controls to be used to set up a monitor mix that combines the inputs and the USB return. However, if you’re sending the whole stereo mix to the USB out, any EQ and effects settings are included. If you need to hear both the inputs and the DAW returns at the same time, then monitoring needs to be handled using the Aux bus, while keeping the channel 7/8 Level control turned right down to avoid feedback. That, unfortunately, means you lose control over the effects — if recording to a DAW, you’ll probably want to record dry and add plug-in effects later, but it might have been nice to have the reverb available for cue mixes. All the current Notepad-series mixers come with PC/Mac routing software, which is essential if you wish to set up USB recording. 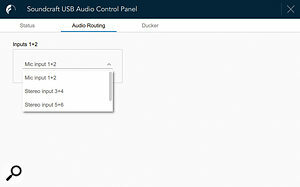 PC and MacOS users can change the USB routing via the Soundcraft USB Audio Control Panel, so that the USB picks up channels 1/2, 3/4 or 5/6 or the main mix. The latest Mac control panel also includes a ducking option, for those radio-style podcasts where the music (the USB return) drops to make way for the voice. This can be controlled by channels 1, 2 or both. Below the input Gain control of each Mic/Line input is a three-band EQ section, offering fixed-frequency cut or boost at 12kHz (shelving), 2.5kHz (bell) and 80Hz (shelving). Only the first two channels have the benefit of EQ, but all channels have an aux/effects send, and pan (balance on the stereo channels) and level pots. All but channels 7/8 have input gain trims. 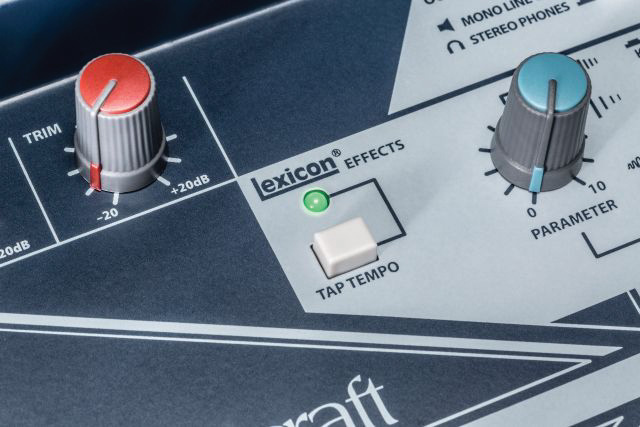 The Effects section includes a Tap Tempo button, an effects Parameter adjustment knob and three latching push-buttons for selecting Delay, Chorus or Reverb — you can push any two down and have two effects at a time. If you push down all three you get a fourth algorithm, with the ominous title of ‘Karaoke’, and which sounds rather like a railway station PA system if you use too much! While the Parameter control does much as you might expect in addressing the main parameters for each effect type, for reverb it also seems to switch between different algorithms, as there’s a brief period of effect muting as you pass certain positions on the dial. This results in a useful range of reverb sounds, from small room to large hall. Note that in the Notepad-8FX, the Aux Master control is situated in the signal path before the effects processor and acts as a master effect send control, affecting the overall wet/dry balance. The larger model, the Notepad 12FX.In the master section, there’s a switch for Mono Line Out or Stereo Headphones out, (which reconfigures the Aux output as a second stereo headphone feed), a Phones Level control with a switch to monitor either the Master Out or Aux (post fader, pre-effects), an Aux master level control, and a short fader to set the main output level. A stereo LED meter (four LEDs per channel) monitors the output. While some routing options might have been included in the hardware to make life easier (eg. 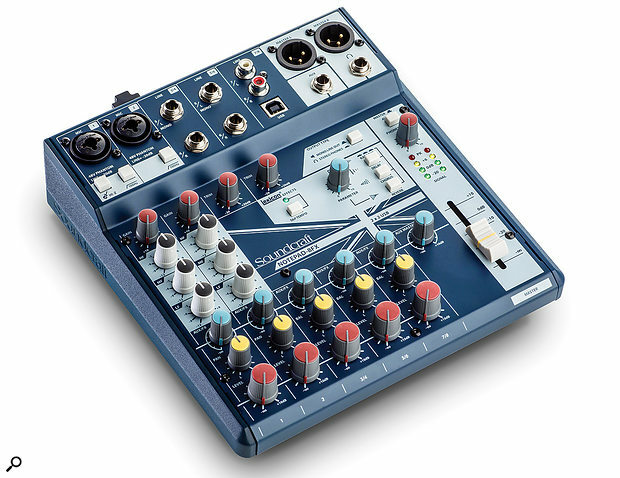 the ability to exclude channels 7/8 from the mix without using the control software), the ability to use software to select any input pair or the complete mix for recording is quite sophisticated for a mixer in this price range. I suspect many users trying to use the ’all-channels’ setting as a source will end up doing some head scratching — but if you just want to use two channels as recording sources everything is dead easy. Note, though, that the USB routing is not remembered by the mixer on power down but is stored by the host software, so you’ll need to set it again if changing hosts. 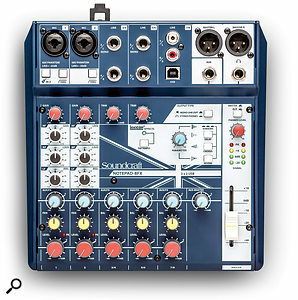 A mixer on this scale and at this budget is inevitably going to be very basic in many respects, but Soundcraft have managed to include two well-specified mic preamps, the Lexicon effects are of a high standard, the EQ on the first two channels has a very clean and polished sound, and having a tap-tempo button for the delay effects is very welcome for live use. Fitting channel level knobs rather than faders is perfectly acceptable on a small mixer as far as I’m concerned, and it helps keep the mixer’s footprint usefully small. 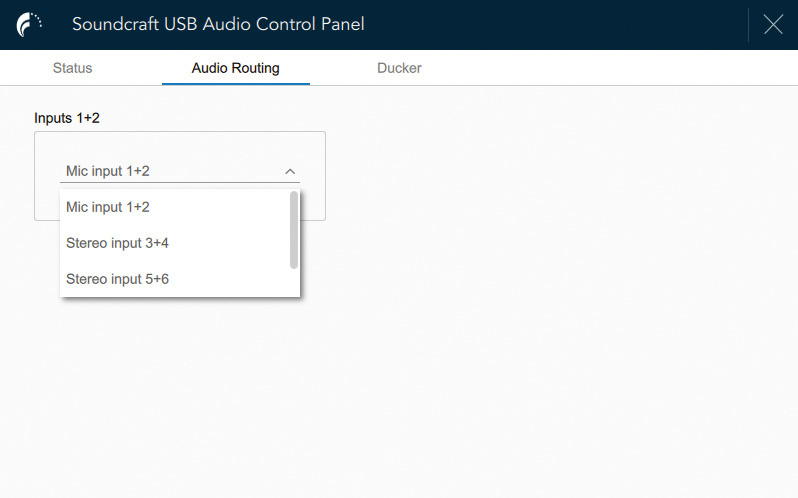 Perhaps the USB routing isn’t as straightforward as it could have been — USB playback might better have been configured as a tape return, as on some other mixers — but the control set is flexible enough to allow you to get most jobs done. Considering that the Notepad-8FX can do the job of many more costly two-channel audio interfaces but can also perform mixing and effects duties for small gigs, it could prove quite an attractive proposition at this price. 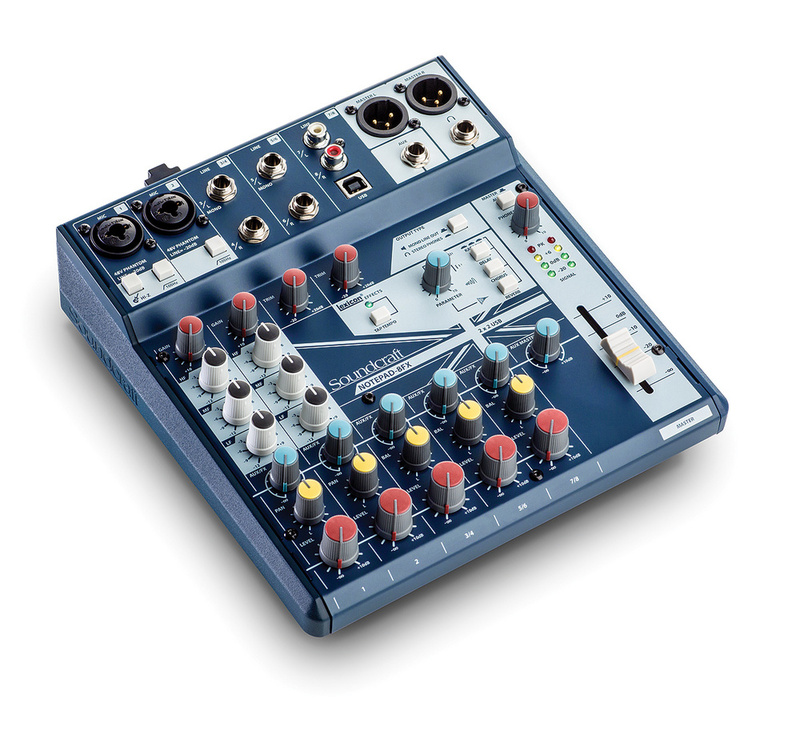 Budget analogue mixers with stereo USB recording included are available from a range of manufacturers, including Yamaha, Allen & Heath, Mackie, Alesis, Alto, Behringer and Phonic. Built-in 24-bit, 2x2 USB audio interface. 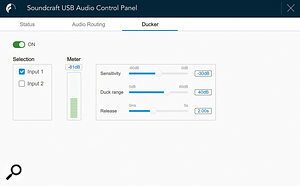 USB routing control panel for both MacOS and Windows. Routing and monitoring has the potential to confuse those wishing to record the whole mix when also listening to the return from the DAW software. Soundcraft have managed to cram high-quality analogue circuitry, a USB audio interface and a flexible feature set into a tiny mixer that costs less than most dedicated audio interfaces. Notepad-8FX £119; Notepad-5 £95; Notepad-12FX £149. Prices include VAT. Notepad-8FX $129; Notepad-5 $99; Notepad-12FX $159.